Oxford Better French is a new practical guide to practise and embed vocabulary, essential grammar, and spoken language in French. Perfect for 11 - 14 year old students , it is ideal for beginners and for making progress in the classroom or on holiday. 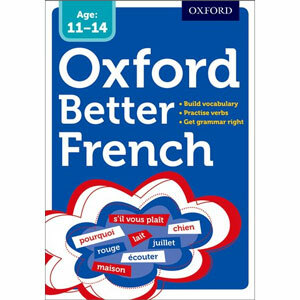 Oxford Better French is has been developed to suit the curriculum requirements of Key Stage 3 pupils (11 - 14 year olds). It would also be suitable for more able upper Key Stage 2 pupils (10+), as well as adults wanting an easy approach to improving their French.